Artists gather at the kiln site early in the morning of the first day. Tables are loaded with wares waiting to be loaded into the kiln. In the background, you can see the mouth of the kiln, its body snaking up the slope, and the chimney rising beyond the enclosure. On the right are the many cords of wood that will feed the Dragon during the three day firing. On one of the tables, my Buddha cups and vases mingle with other artist's wares, awaiting loading. Gordon stands in front of the many cords of wood that will be consumed in the three day firing. 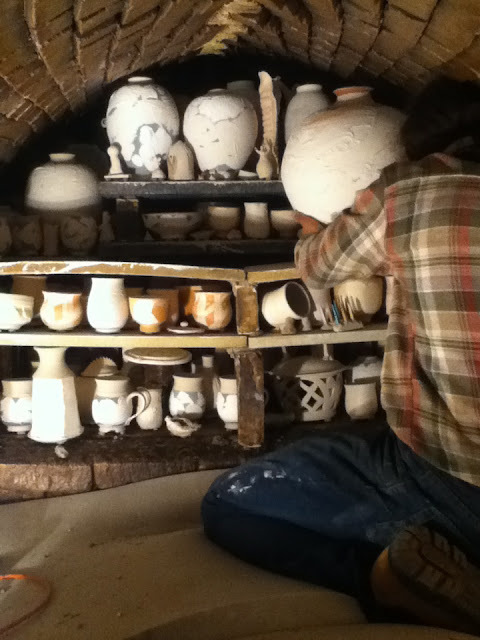 The loading of the kiln takes most of the day. Each piece is placed meticulously, with thought to where it will fit best, how it will affect the pieces around it, and of course how the flame, ash, and vapour will conspire to embellish it. The kiln mouth on Day Two.